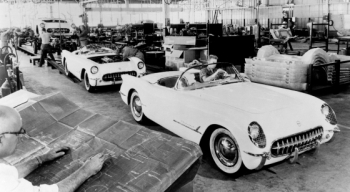 There’s an old saying – “you have to start somewhere”, for the Corvette it started from very humble beginnings as Chevrolet’s answer to those little European two-seater sports cars that were popping up all over the US after WWII (World War II). After WWII, America was embarking on its greatest economic boom, one that would last for a few decades until the downturn of the 1970s. Most American cars right after WWII were mundane and boring, like a shoe salesman convention in Cleveland. However coming from war torn Europe was the emergence of a new type of car – the two-seater sports car. These were a new breed of cars, which were small, with good handling, and good performance. Automakers like MG, Ferrari, Porsche, etc. were beginning to forge their own little niche into this emerging market. Chevrolet saw this new emerging market, and decided on a course that would make automotive history. Taking a jaunt back in time to the early 1950s, Chevrolet even thinking about producing a 2-seat sports car was nothing short of a miracle or insanity depending on your point of view. Chevrolet’s main mission since its inception was to produce reliable cars for a reasonable price. Not where you would expect a 2-seat sports car to emerge. Chevrolet was bound and determined to make a 2-seat concept sports car for the 1953 GM Motorama show. Haley Earl and his design team came up with a futuristic 2-seater body design for this car, it was made using a new material called fiberglass. GM had never produced a car with a fiberglass body before so this was new territory. The advantage of using fiberglass was that it weighed less than metal body panels. In January 1953 at the GM Motorama show the EX122 Corvette concept car was unveiled to much better than expected fanfare. This prompted Chevrolet to green light the production of a limited number of EX122 Corvettes for the 1953 model year. Chevrolet would drop the EX122 designation for production and the car would be simply be called – Corvette. The name Corvette was derived from a type of small fast warship used during WWII, it seemed to be the perfect name for a car that would in few short years become a legend. The 1953 GM Motorama show debut of the EX122 Corvette not only allowed for the production of the Corvette, but also would in an unexpected way ensure its future as a performance car. What many don’t know is that Zora Arkus-Duntov was among the many in attendance at the 1953 Motorama show to view the Corvette. Duntov instantly fell in love with the car, and soon thereafter began working for GM, in a role as chief Corvette engineer. Duntov was responsible for cultivating the Corvette during its early formidable years and shifting its focus to a high performance sports car giving it a permanent niche that the Corvette still fills even today. This all started with Duntov insisting that the 1955 Corvette be equipped with the new for 1955 – 265 CID V8. From then on things for performance oriented buyers would only get better. The EX122 Corvette show car had under the hood a modified Blue Flame straight 235 CID 6 cylinder motor. The Blue Flame by today’s standards seems very anemic, however back in 1953 it was Chevrolet’s best and hottest motor. The modified Blue Flame motor from the Motorama show EX122 Corvette would make it into the production 1953 Corvette. The modified Blue Flame motor made an impressive 150 horsepower when compared to the standard 115 horsepower Blue Flame. The extra power came from three Carter side-draft carburetors, a high performance cam, and a split exhaust manifold. The 1953 Corvette’s Blue Flame had a compression ratio of 8.0:1 which for its day was very performance oriented. Helping in performance was a solid rear axle with a 3.55 ratio. The only transmission available on the 1953 Corvette was the 2-speed Powerglide automatic. Fortunately the shifter for the automatic transmission was on the floor between the two seats and not on the column, so at least it looked sporty. And Chevrolet did not forget about handling it gave the Corvette in the front – coil springs, a stabilizer bar, and tubular shocks. The rear had leaf springs and tubular shocks. Helping to keep the Corvette planted when cornering were 6.70×15 tires which had the famous wide white walls. Adding to the look of the tires were stylish chrome plated hubcaps with painted red accents. The body of the 1953 Corvette was a head of its time, it was sleek and aerodynamic and its space age looking wrap-around windshield, front-end with wire-mesh headlights, and futuristic taillights made the car a real looker. The Corvette was truly a piece of fine art even the reverse flip-up front hood and the finely sculpted interior were testaments to this fact. However art sometimes forgets about functionality, and one of the 1953 Corvette’s shortcomings was it was built as a roadster with no rollup windows and no removable hardtop option. There was only a black canvas top with side curtains to keep the rain out. Only 315 1953 Corvettes were produced all of these were painted Polo White and had Sportsman Red colored interiors. The interior was very futuristic and the main overall design theme would stay with the Corvette through 1962. The steering wheel was smaller than most cars and looked liked it belonged in a sports car. The body panel piece that separated the back of the two seats was a nice touch. The finely sculpted dashboard seemed like it had more instruments than a DC-6 airliner and even included a standard tachometer, something that was unheard of back in 1953. The seating position was very low which gave the driver and passenger the feeling of sitting in a race car. Chevrolet never expected to produce the Corvette. It was merely a concept car but when it proved much more popular than expected at the 1953 Motorama, Chevrolet realized that it needed to produce the car. Since Chevrolet had such a short time to get a concept car into production there were a few shortcomings this first year of the Corvette. The first of which was that it was a low volume car. Chevrolet fixed this problem by mandating that dealers only sell 1953 Corvettes to VIPs, this would give the Corvette a mystique of being a car of distinction but it ensured that ordinary buyers were left out in the cold in 1953. Another problem was that the fiberglass body that was new territory for Chevrolet and GM, which meant experienced outside help was needed to produce the fiberglass panels. This job of producing all 46 fiberglass pieces of the 1953 Corvette fell on the lap of the Molded Fiber Glass Company of Ashtabula, Ohio. Combining all these above factors it comes as no surprise that there were some quality control problems and fit and finish problems related to the new fiberglass panels. This however was a short-lived problem that was corrected by 1954. Even with all these things considered and a hefty base price of $3498, the 1953 Corvette was in high demand. In retrospect the Corvette had a great start in 1953, with each successive year for many years having a continued improvement in looks, performance, handling, and sales numbers. Duntov took care of the performance for many years while Bill Mitchell and his cohorts kept improving Harley Earl’s original Corvette design. The end result is the Corvette is now referred to as – America’s sports car. 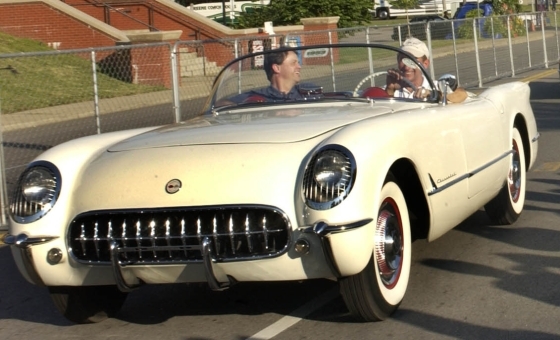 Nobody can deny what the 1953 Corvette can be summarized as, is – the start of something great.